The day before their client was to be tried on four felonies that could have put him away for life, defense lawyers Clive Stafford Smith and Harold DuCloux had a problem: They wanted to interview the man their client was charged with shooting, but they couldn’t find him. It turned out the alleged victim was right around the corner from the courthouse, in jail. A prosecutor had him arrested because, she said, he wasn’t cooperating. The defense attorneys asked the judge to toss some of the charges against their client, Quincy Brown, because they hadn’t been notified — and because the prosecutor had cited a misleading subpoena in seeking the arrest warrant. “This presents another illegality that must be addressed by this Court,” the defense attorneys wrote in their request. The judge, however, did not address it. That was in 2001. It’s the earliest of eight incidents uncovered by The Lens in which judges heard that prosecutors were passing off phony documents as real, court-ordered subpoenas. In the 2001 hearing, Stafford Smith said the notices were illegal. This year, a lawyer called them “secret.” Another lawyer told a judge that the DA’s office had misled her for years. Their allegations seem to have had little effect. Prosecutors sometimes withdrew the bogus subpoenas when they were challenged in court. Occasionally they asked judges for real ones instead. Lawyers and judges moved on. One judge took an interest in the matter when, for the second time in three months, a lawyer asked her to throw out a fake subpoena. But the DA’s office continued to use them until April, when The Lens revealed the practice. A prosecutor who used “DA subpoenas” — that’s what they called them — in the late 1990s is now a judge in Criminal District Court. In 2015, Judge Karen Herman signed arrest warrants for two witnesses because they hadn’t obeyed fake subpoenas, according to a federal civil rights lawsuit. Under state law, prosecutors can subpoena a witness to appear for a private interview, but first they must get a judge’s approval. In some cases — it’s unclear how often — New Orleans prosecutors skipped that step and delivered their own documents that appeared to be authentic. Legal experts have told The Lens that likely violated state ethics rules for attorneys. The state Code of Judicial Conduct says judges “should take or initiate appropriate disciplinary measures” for suspected misconduct. There’s no sign that happened. The state Office of Disciplinary Counsel, which investigates this sort of thing, learned about the fake subpoenas in April from The Lens. Chief Disciplinary Counsel Charles Plattsmier, who has been with the office for about 21 years, said he couldn’t recall being alerted to it before. His office has since opened an investigation into the practice. The federal lawsuit argues people’s civil rights were violated when they received fake subpoenas and were arrested for disobeying them. In the suit, two civil rights groups say they found six witnesses and victims who were arrested because they didn’t obey fake subpoenas. 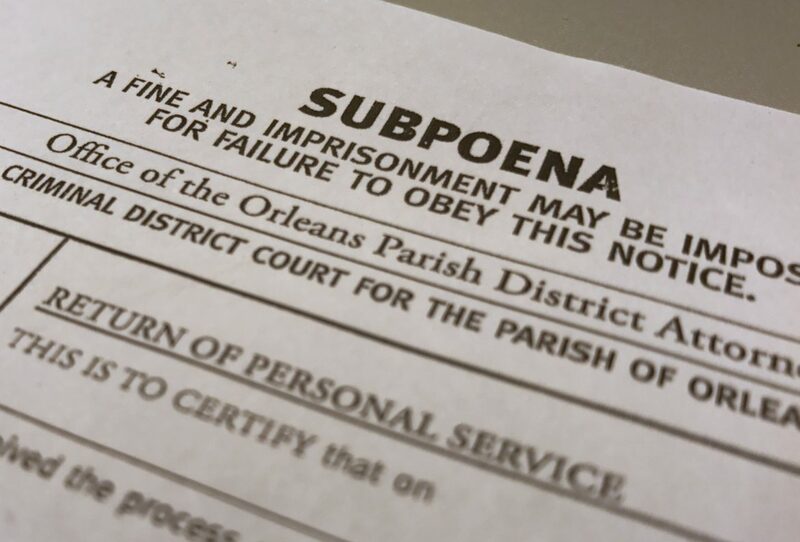 Orleans Parish District Attorney Leon Cannizzaro has said “DA subpoenas” were improper, but he characterized them as essentially harmless. In the months leading up to The Lens’ initial story, the practice was brought up six times before four Criminal District Court judges: Paul Bonin, Laurie White, Robin Pittman and Camille Buras. Buras also handled the case in 2001, in which the defense lawyers learned the victim had been jailed for not cooperating. Prosecutor Jackie Maloney wrote in her application for an arrest warrant that the victim, Leonard Jordan, had ignored a legitimate subpoena to appear in court as well as “District Attorney subpoenas” to show up for private meetings. Maloney did not respond to a request to comment for this story. Her former boss, Harry Connick Sr., said he knew about the practice. He said they were used “on a limited basis” when prosecutors couldn’t get witnesses to talk. But records show they were used 10 times in the Brown case alone. The documents used under Connick didn’t say “SUBPOENA,” nor did they threaten jail and fines, like the ones sent under Cannizzaro. But they looked like court orders, telling people they were “hereby notified” to appear at the DA’s office. The use of misleading DA subpoenas came up twice in the Quincy Brown case, in 2001 and 2006. Transcripts show that Criminal District Court Judge Camille Buras did not address their legality either time, instead focusing on defense attorneys’ other arguments. A fake subpoena came up again last year in Buras’ courtroom, shortly before Cardell Hayes went on trial for killing former Saints player Will Smith. Prosecutor Laura Rodrigue sent a fake subpoena to Tiffany LaCroix, Hayes’ girlfriend. Anthony Ibert, LaCroix’s lawyer, asked Buras to toss it, and the DA’s office responded by withdrawing the notice. Buras declined to comment for this story. In March, Judge Paul Bonin had presided over Section D of Criminal Court for only a few months when a fake subpoena was brought to his attention. Prosecutor Inga Petrovich wanted to talk to Fayona Bailey, whose boyfriend had been charged with second-degree murder. So Petrovich had a fake subpoena delivered to Bailey’s house. DA employees twice threatened Bailey with jail if she refused to come in for an interview. Bailey hired Ibert, who argued that the subpoena was invalid. Bailey and LaCroix are now plaintiffs in the federal lawsuit against the DA’s office. Bonin said in an interview he had leaned toward granting Ibert’s request to throw out the subpoena because it hadn’t been authorized by a judge. But before Ibert could make his argument in court, Petrovich withdrew the fake subpoena. That rendered Ibert’s motion moot. Bonin said that was the only time he’s dealt with a fake subpoena, and he didn’t know about the practice before that. He was the only one of the four current judges who sat down to discuss his handling of the notices. Ibert, who dealt with fake subpoenas four times in five months starting in late 2016, said judges may not have fully understood what was going on. “Maybe the defense bar … didn’t do a good enough job briefing them on the horrors that could occur,” he said — such as being jailed for disobeying a legally worthless document. In March, prosecutor Tiffany Tucker asked Judge Robin Pittman to issue an arrest warrant for Keith McGuire, the victim in a battery case. Johnquell Bibbins had been accused of breaking McGuire’s jaw two years earlier. Tucker wrote that McGuire had ignored a subpoena to come to court one day and had not showed up another day “at the District Attorney’s Office pursuant to [a] subpoena.” She wanted to jail him to force him to testify, which the law allows. Pittman signed the warrant, and McGuire was jailed for eight days. The civil rights suit contends one of those subpoenas was a forgery. Attorneys for the ACLU and the Civil Rights Corps allege Tucker or someone working on her behalf altered a genuine court subpoena to make it appear as though McGuire had been ordered to appear at the DA’s office. On March 10, several days after McGuire had been arrested, Ibert went to court. He pointed out that the subpoena to appear at the DA’s office was invalid because a judge hadn’t signed off on it. And, he argued, McGuire should have been allowed to see a judge within 72 hours of being arrested. Ibert asked Pittman for a hearing on McGuire’s arrest, according to court records. Three days later, when the battery case was scheduled to go to trial, Pittman denied his motion. McGuire testified at the trial, reluctantly confirming that he had identified Bibbins to the police as his attacker. He also testified that Bibbins’ mother had paid some of his hospital bills. McGuire was no longer needed. Pittman recalled the arrest warrant and he was freed. Bibbins was convicted and sentenced to five years in prison. Should judges have reported prosecutors for using fake subpoenas? Under the state Code of Judicial Conduct, judges are supposed to tell the state Office of Disciplinary Counsel when they suspect an attorney of a serious ethical breach. Any discipline is up to the state Supreme Court, which has recognized judges’ responsibility to report misconduct. That language makes it extremely unlikely that a judge will be disciplined for not reporting misconduct, said Dane Ciolino, a Loyola University law professor and ethics expert. But judges have been disciplined for violating other provisions with similar language. Bonin said he didn’t consider reporting Petrovich “because the subpoena was withdrawn.” He couldn’t find any Louisiana case law addressing the use of unauthorized DA subpoenas. If someone has been jailed for disobeying a fake subpoena, Bonin said, his lawyer is responsible for bringing that before a judge. A ‘special secret’ subpoena or a real one? That’s close to what happened earlier this year in Judge Laurie White’s courtroom. In January, she issued an arrest warrant for the alleged victim in a domestic violence case. The prosecutor wrote in his motion to arrest the victim that he had “attempted to serve the victim with a subpoena through an investigator.” It was fake, as Cannizzaro later admitted. White didn’t know it wasn’t real when she issued the arrest warrant. However, she didn’t recall the warrant when two lawyers told her, according to a transcript of the hearing. The judge discussed the case in a brief interview but declined to comment further, citing the ongoing federal lawsuit. She said her concern about the warrant “doesn’t come off in the transcript,” and there was more discussion off the record. Later that day, prosecutor William Dieters dropped the charges. The alleged victim wasn’t there to testify, and White wouldn’t allow the trial to be rescheduled again. With no trial to force the woman to testify at, White recalled the warrant. The woman was never arrested. Two months later, however, White did take the DA’s office to task. It happened in March, during the trial of Ali Sadeghi, a surgeon who was accused of secretly videotaping naked patients. Sadeghi was ultimately acquitted. Rodrigue, the prosecutor, told White that a witness hadn’t shown up to testify after being subpoenaed. But White couldn’t find the witness’ name in CourtNotify, the court’s subpoena tracking system. The judge became angry, suspecting the prosecutor was trying to pass off a fake subpoena as a legitimate one. “Those are DA subpoenas you’re talking about, not trial subpoenas,” she said. Rodrigue instead provided a text message from the witness to show she had gotten the subpoena. Sadeghi’s attorney, Michael Magner, began to suggest why there weren’t any court records. White became angry, suspecting Rodrigue was trying to pass off a fake subpoena as a legitimate one. “Those are DA subpoenas you’re talking about, not trial subpoenas,” she said. The judge called a district attorney investigator to the stand and put him under oath. She repeatedly asked him and Rodrigue whether they had served the subpoena legally. It’s not clear from the transcript what had happened — whether the DA’s office had used a fake subpoena ordering the witness to come in for an interview or if it had improperly served a subpoena to testify at the trial. Rodrigue denied using a fake subpoena in the case, and the DA’s office said there aren’t any records of those documents in the Sadeghi case file. The next month, the day before The Lens reported on the DA’s practice of sending fake subpoenas, another one came before White. This time, it was during a murder trial against Tavis Leonard. One of Leonard’s alleged shooting victims had told police he knew who the shooter was, according to court records. Later, though, he told prosecutors he couldn’t testify that Leonard was the shooter. The alleged victim said in an interview that prosecutor Jason Napoli called him a liar. The man, who spoke to The Lens on the condition that he not be identified, was recently indicted for second-degree murder in an unrelated case. When he met with Napoli, the man was given a fake subpoena to come to another private meeting right before trial. He ignored that. He also ignored a genuine subpoena ordering him to testify in court. The defense lawyer said at least one of the documents summoning his client to court appeared to be an invalid DA subpoena. “I’m not sure my client ever got a court subpoena from this court,” he said. Napoli wanted to arrest the man to force him to testify. David Capasso, the man’s lawyer, told White his client had told him “he was being threatened and harassed” by Napoli. Capasso said at least one of the documents summoning his client to court appeared to be an invalid DA subpoena. “I’m not sure my client ever got a court subpoena from this court,” Capasso said. White, however, was concerned with moving the trial along. A jury had been seated. Witnesses were ready to take the stand. She decided not to issue an arrest warrant, opting to give the man until that afternoon to pick up a subpoena for the next day. But she didn’t pursue Capasso’s allegation, either. A number of judges prosecuted cases at the courthouse before they were elected to the bench, including Pittman, Buras, White and Herman. He was referring to Karen Herman, who worked at the DA’s office from 1991 to 1999. She signed seven DA subpoenas in the Quincy Brown case, according to records Bourke provided. They all “notified” witnesses to appear at the DA’s office to “testify” — language that, according to legal experts and lawyers, most people would think was legally binding. But Connick said prosecutors didn’t think much about the propriety of it at all.